I have always believed that a superb art no matter what medium it is should be something that emits emotion subject to the sensors’ perception. It should be an art that is open to the subjective interpretation by the people who experiences it. This precept is especially true of the Filipino film entitled Tuos, an official entry in the 2016 Cinemalaya Film Festival presently running at the Cultural Center of the Philippines. The conduct of the story as well as the moods of each of the characters in the film are all subject to the interpretation by the viewers. Directed by Derick Cabrido, I consider Tuos as one of the most exotic Filipino film from among the Filipino films that I have seen. Though the movie has the tendency to get quite dragging, some of the rich colors of the Filipino customs and culture were shrewdly presented. And aside from the impeccable acting of the legendary Filipino actress, Nora Aunor who plays Pina-Ilog in the movie, what particularly impressed me by Tuos were the additional layers of art that were fittingly mixed in the story. The landscape presented in a modern visual art and the haunting old folklore of a song mixed together during the animation portion of the movie were pure brilliance. These layers of art added up to the already rich texture of the movie. When the movie ended and was already rolling its credits, I was left s mystified, stunned and thinking. With my limited cerebral capacity, I tried interpreting the scenes and the narratives that were presented. And there’s one last thing that I realized about Tuos, that it is indeed one exotic and powerful movie that only the smart and brainy human beings would be able to appreciate. Sori na lang sa mga bobo, pang matalino lang ang pelikulang ito. Perceiving the unseen world of angels, ghosts or elements from a different plane and dimension is not my sixth sense. It is because what I consider as my sixth sense is my sense of humor. And this has recently been sharpened and utilized when I recently laughed so hard inside a cinema. 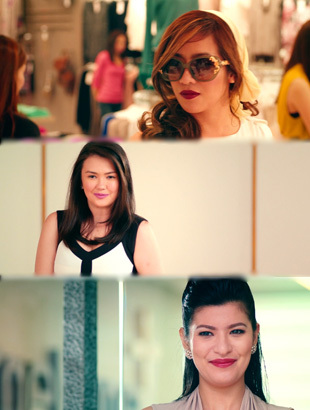 It is because of the Tagalog/Filipino movie Beauty In A Bottle that stars Angelica Panganiban, Assunta De Rossi and Angeline Quinto which I, Nengkoy and thirteen other members of my family watched. Beauty In A Bottle is the type of movie that you would not mind in the end if it was good or bad. But what matters most was the spending of considerable amount of time having a good laughing spell. The movie flutters basically about the old principles of ‘inner beauty’ and ‘self-esteem’ hilariously being paralleled to having smooth skin, young age, desirable diction and attractive body. I don’t remember when was the last time I laughed this hard on a Tagalog/Filipino movie. It was a riot! It was so funny I was having pits of persistent laughter even by simply seeing the movie’s video loop ads when we were already out of the movie theater. But if I deeply assess what the movie waves about, maybe the reason why my sixth sense had a good workout is because I can relate. The very same hardships that the main characters in the movie are having trouble about – the rekindling of “the young and beautiful you” – are the very same troubles that I have been irrationally minding about. The theme is so close to my being! I was like laughing at my own reflection! Laugh at yourself! Hone your sixth sense! See Beauty In A Bottle! 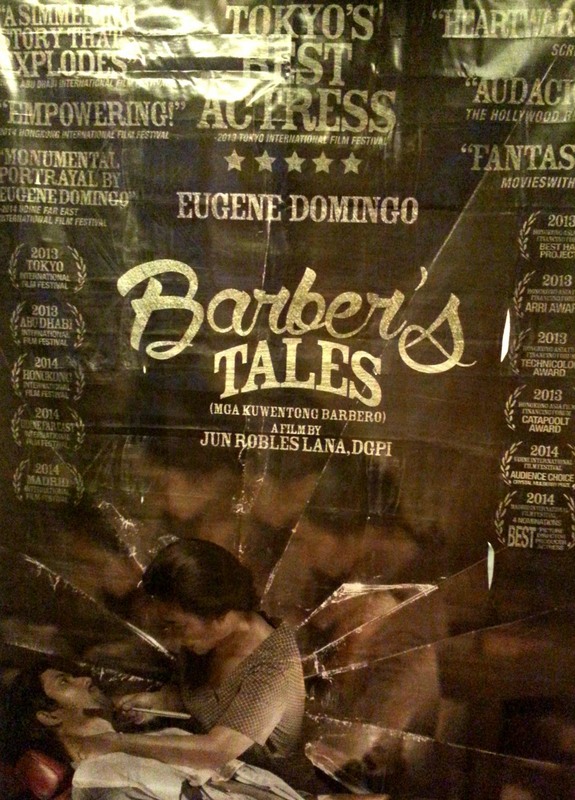 All elements of a good movie seem to be present in the film Barber’s Tales written and directed by Jun Lana. Everything in the movie though simple in its attack seems mesmeric. It is so good the viewers at the end of the film could not control from clapping their hands. It is a quiet movie yet its overall effect encompasses viewers’ expectations of a well-made film: honest-to-goodness directing and storytelling; unpredictable twists and characters; so-true-to-the-character acting performances; skillful use of the Filipino language; unobtrusive and discreet use of music that mixes naturally with the sound of the environment; and, lastly the brilliant use of old and faded colors. I know there have been heaps of positive reviews and blog posts written about Barber’s Tales highlighting on how good the story is, how cohesive the direction and cinematography was or how impressive the actors were. Thus with this post, let me honor one aspect of the film that seems to have been slightly neglected. The production design. Being a person who grew up in the era on when the story wheeled on, this element of the film truly delighted me. Thus, for me, Chito Sumera, the production designer of the movie is one of the movie’s superstars. The movie’s production design brought me back to my pre-school years in Pasay. I agreed with all the 70’s period props and costumes featured in the movie. From the prostitutes’ usage of pink plastic rolers (curler tubes) on their hair, the presence of old transistor radio inside the barbershop, the usage of hoary kulambo (mosquito net), the presence of time-consuming ginanchillo (crochet fabric) on top of the rickety-looking tocador (a dresser) and even the old magazine with Margie Moran on its cover were all genuinely amazing to see. These well-researched props made me further feel the critical sensory-emotional values of the film. I actually whispered to Nengkoy while the movie was running if she noticed and still recalls those reliable tin metal batya (laundry tub) which the main character and her best friend were using in one of the beautiful scenes. These key design elements further elevated the film to be closer to what is the truth and what has existed in the past, thus, making the story so real. The Barber’s Tales is still showing in few selected cinemas in the metro. For its ‘true’ aesthetics, this film is definitely a must watch movie.